Get Your News Out Fast with this Express Press Release Submission Gig. Don't wait for days to get your news submitted. We are Offering 24 Hour Turnaround for your Press Releases. Submission to SBWire Premium and 10+ Other PR Services. 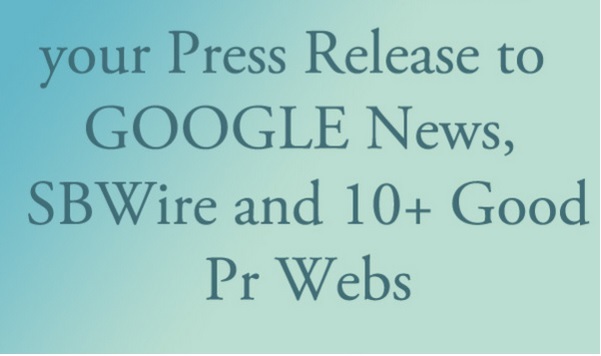 SBWire is a premium paid press release service that charges 30 dollars per submission and submit your PR to tons of other news media for maximum exposure and traffic. I will also manually submit your article to 10 other good PR websites for more exposure. Great forSEO, Traffic and Backlinks. Great for Conversion of Affiliate Products and Clickbank Products. Complete report of live links provided - Images and Video Allowed - Upto 4 Hyperlinks Allowed.New $40 Gig Extra offers Guaranteed Appearance on 500+ Local and International News Websites and 100+ Blogs. Also a Social Media Blast to 15 Most Popular Social Networks Like Facebook, Twitter, StumbleUpon, Tumblr and More. A MUST HAVE for BEST RESULTS. EXTRA (for additional $40) - I will subm!t to MAJOR PREMIUM OUTLETS like CBS, Fox, ABC, CW, NBC affiliated websites. PLEASE ORDER GIG EXTRA # 1 TWICE IF YOU WANT APPEA RANCE ON PREMIUM NEWS OUTLETS.